I don’t know if he did or did not touch the boy. the village schoolhouse, where he was the teacher. his name and the pews cleared out to find him. He was twenty-one, thought of himself as an exile. He was boarding with the boy and his family. The boy was a boy in that schoolroom he hated. where he had been hiding. He was led outside. up again, showing he was back in the big city. and women. The names of ferry boats and trains. The name of the village, which was Southold. The name of the preacher, which was Smith. 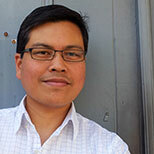 Rick Barot has published two books of poetry with Sarabande Books: The Darker Fall (2002), and Want (2008), which was a finalist for the Lambda Literary Award and won the 2009 Grub Street Book Prize. His poems and essays have appeared in numerous publications, including Poetry, The Paris Review, The New Republic, Ploughshares, Tin House, The Kenyon Review, Virginia Quarterly Review, and The Threepenny Review. He has received fellowships from the National Endowment for the Arts, the Artist Trust of Washington, the Civitella Ranieri, and Stanford University, where he was a Wallace E. Stegner Fellow and a Jones Lecturer. He lives in Tacoma, Washington, and teaches at Pacific Lutheran University, where he also directs The Rainier Writing Workshop, the low-residency MFA program in creative writing at PLU. His third collection, Chord, will be published by Sarabande in 2015.